Below are a growing number of quotes and documents that confirm the Seventh Day Adventist church (SDA) is in fact part of the Vatican's World Council of Churches (WCC). But before sharing that, what about the National Council of churches (NCC) that the SDA church claims they never participated in? They actually stated back in 1967 the following. "...we do not make contributions to their [NCC] program." -Letter from the General Conference of Seventh-day Adventists, January 25, 1967, from D.W. Hunter, Associate Secretary. 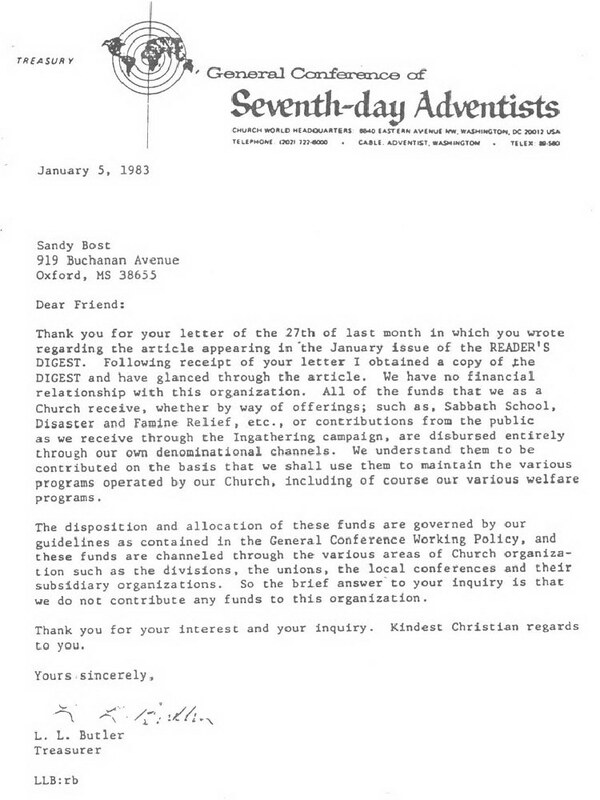 1959 SDA church sent $6,700 for NCC support. -Letter from the National Council of Churches, January 29, 1960, Donald F. Landwer, Assistant General Secretary for [NCC] Finance. 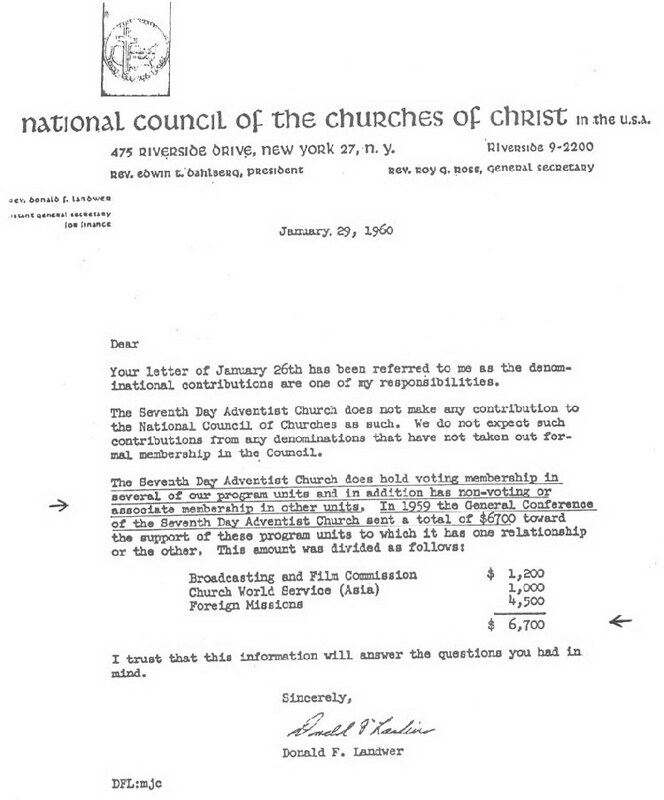 1969 SDA church sent $5,950 for NCC support. 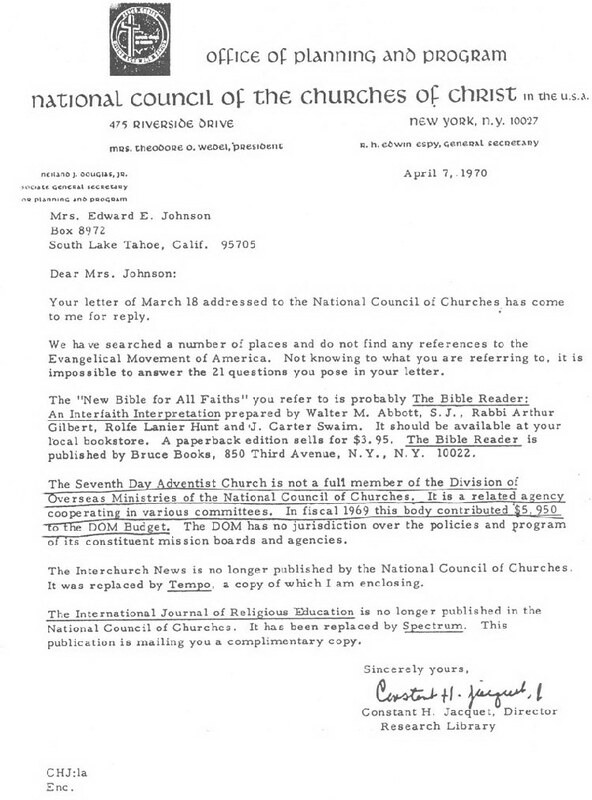 -Letter from the National Council of Churches, April 7, 1970, Constant H. Jacquet, Director Research Library. So, it appears the SDA church associate Secretary (D.W. Hunter) is either lying or ill informed. The reason I shared the two donations to the NCC is because this allows us to see that this has been going on for some time in the SDA church. But let's jump a few years forward after the WCC was seeking support as it was racing towards it's final "one world church" prophesied position on June 26, 2000. As is obvious for any business venture, support must be initiated long before the foundation can be set at the wall structure can find a footing. 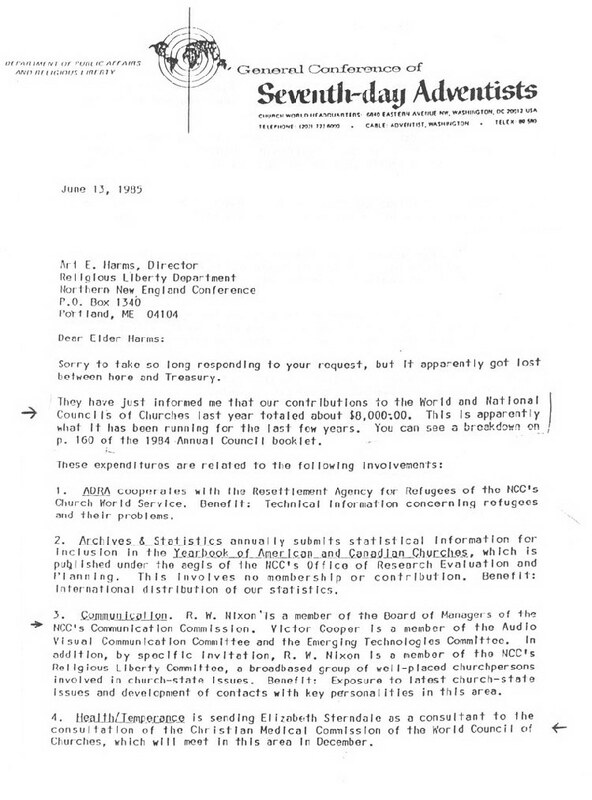 So, that being said, and since we know the SDA church did in fact donate to the NCC, did is donate to the WCC as well? And when asked, did they tell the truth this time? "We have no financial relationship with this [WCC] organization. All of the funds that we as a Church receive...are disbursed entirely through our own denominational channels. We understand them to be contributed on the basis that we shall use them to maintain the various programs operated by our Church, including of course our various welfare programs... "So the brief answer to your inquiry is that we do not contribute any funds to this [WCC] organization." -Letter from the General Conference of Seventh-day Adventists, January 5, 1983, from L.L. Butler, Treasurer. "The Seventh-day Adventist Church...does not pay one cent in support of it [the WCC]." -Adventist Review, January 3, 1985, p 4. So again, is this true? 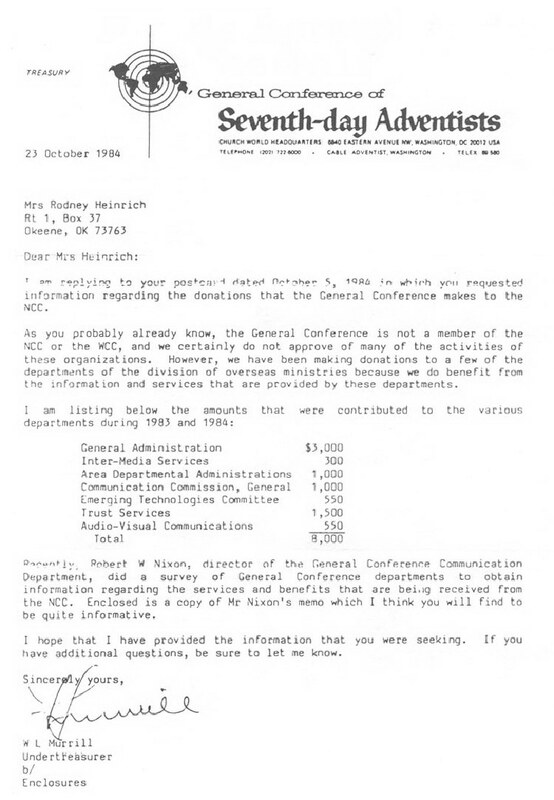 1984 SDA church sent $8000 for WCC support and then declared in writing, "This is apparently what it has been running for the last few years." -Letter from the General Conference of Seventh-day Adventists, June 13, 1985, Mitchell A. Tyner, Esq., Associate Director and Legal Counsel of the Department of Public Affairs and Religious Liberty. 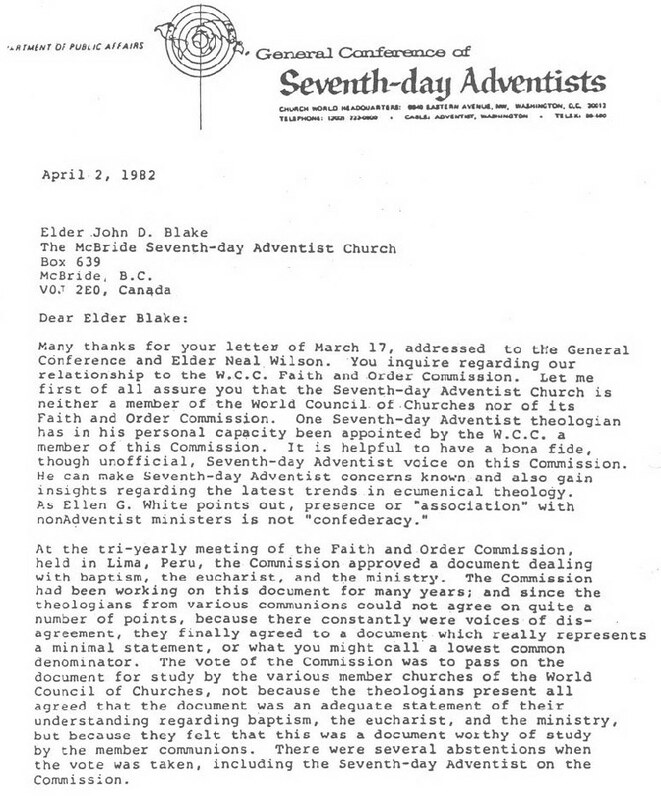 Also see Letter from the General Conference of Seventh-day Adventists, October 23, 1984, from W.L. Murrill, Undertreasurer. Still, even though they have been caught lying about funding the NCC and WCC, does this mean the SDA church is a member of the NCC and WCC? Yes, it does. But let's ask them first to make sure we don't assume things. When asked about being a member of the NCC or WCC the SDA church said the following. "Seventh-day Adventists are not members of the National Council of Churches." -Letter from the General Conference of Seventh-day Adventists, January 25, 1967, from D.W. Hunter, Associate Secretary. "...the Seventh-day Adventist Church is not a member of the World Council of Churches..." -Letter from the General Conference of Seventh-day Adventists, Department of Public Affairs, from B.B. Beach, April 2, 1982. "Let me first of all assure you that the Seventh-day Adventist Church is neither a member of the World Council of Churches nor of its Faith and Order Commission." -Letter from the General Conference of Seventh-day Adventists, Department of Public Affairs, April 2, 1982, from B.B. Beach, Director. 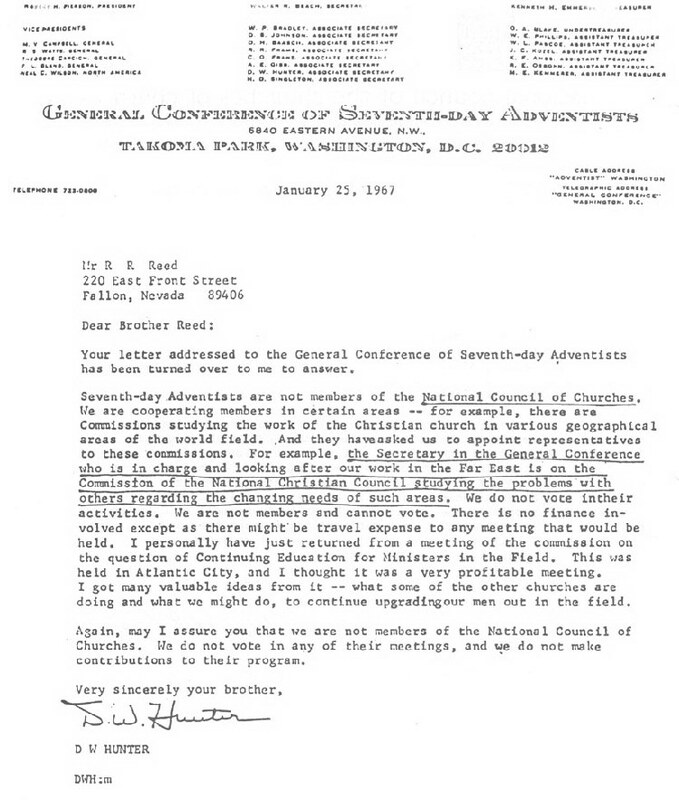 "...the General Conference is not a member of the NCC or the WCC..." -Letter from the General Conference of Seventh-day Adventists, October 23, 1984, from W.L. Murrill, Undertreasurer. "No. The Seventh-day Adventist Church is not a member of the World Council of Churches..." -Adventist Review, January 3, 1985, p 4. "The Seventh-day Adventist church is not, has not been, will not be a member of the World Council of Churches. I don't care what evidence you have printed to the contrary. It is simply a fabrication; it is not true; it is a lie; it is a distortion. I want to make sure you understand it. There is NO membership or intention of becoming a member....We are not and will not be. I hope you can take that to the bank as a statement of categorical, undeniable truth. And anything that you receive printed to the contrary, tear it up, throw it in the waste paper basket; its simply not the truth!" -Robert Folkenberg, "Issues and Interviews" on SDA radio station--KCDS in Angwin, California, February 19, 1993. Again, is this true? Is the SDA church a cooperating member as well as a promoter of the Vatican's NCC and WCC? Or is it as the past "world" president of the SDA church claims? Is it all just a lie, or a fabrication when we say they are members and promoters of the NCC and WCC? What do the facts dictate? SDA church was listed as an associate member of the National Council of Churches in 1959. -Letter from the National Council of Churches, August 7, 1959, Wesley B. Goodman, Associate Executive Director. 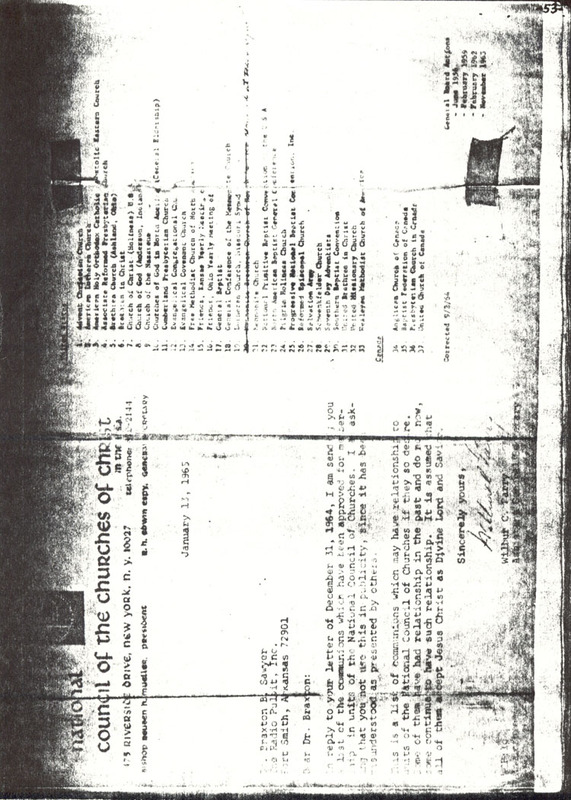 SDA church was listed as a member-unit of the NCC in 1964. -Letter from the National Council of Churches, January 13, 1965, Wilbur C. Parry, Assistant Council Secretary. The W.C.C. is not to be faulted on what it endeavors to do....The call comes out of Vancouver in 1983 for a New World Order... My point is that the W.C.C., as the most powerful Christian social agency may well be the world's answer to idealize as well as apply the social ministry of Jesus Christ...and in the establishment of the literal Kingdom of God." -Ministry Magazine, November, 1983. As cooperating members and promoters of the NCC and WCC does this mean the SDA church has voting privileges in the Vatican meetings of the NCC or WCC? "The Seventh-day Adventist Church does hold voting membership in several of our [NCC] program units and in addition has non-voting or associate membership in other units." -Letter from the National Council of Churches of Christ, January 29, 1960, from Donald F. Landwer, Assistant General Secretary for Finance. "Over one hundred theologians met in Lima, Peru, in January, 1982, and recommended [voted] unanimously to transmit this agreed statement--the Lima text--for the common study and official response of the churches. They represented virtually all the major church traditions: Eastern Orthodox, Oriental Orthodox, Roman Catholic, Old Catholic, Lutheran, Anglican, Reformed, Methodist, United, Disciples, Baptist, Adventist and Pentecostal." -Faith and Order Paper #111, Baptism, Eucharist and Ministry, back cover, published by the World Council of Churches, Geneva, 1982. Is the SDA church actively involved in NCC and WCC ecumenical promotions form mother Rome? "The National Council of Churches presents a production of the Seventh-day Adventist Church." -Adventist Review, December 15, 1994, p 7. Also see TV Guide, December 24-30, 1994, p 55, vol 42, #52, Issue #2178. The SDA church and NCC joined as one to nationally televise a Christmas Eve Special called "A New Noel." -Adventist Review, December 15, 1994, p 7. So, is it working? Is Rome's plan to merge all the churches together as one working and is the SDA church helping Rome do just that? What do the following comments of the SDA church tell you? "Those gathering together to praise the Lord in song were from the following churches: Raymond Blackford, Bethel Lutheran; Dr. William Early, Cicero Methodist; Rev. Stephen Bard, Cicero Wesleyan; Father Duane Craycraft, Sacred Heart Catholic Church; Rev. Don Paden, Cicero Christian; and Pastor Randal Murphy, Cicero SDA Church." -Review and Herald, March 9, 1967. "What we like about this going concern is that it has cut across denominational boundaries. At the recent election of officers at the annual general meeting [of the Asian Aid Organization], a new committee was elected. It consists of two Catholics, one Presbyterian, one Anglican, one Pentecostal, and four Australian-Chinese Adventists." -Record, September 3, 1973. "...members of the Japanese Adventist Church...[attended] an ecumenical worship service held in January at St. Pius X Roman Catholic Church. [SDA] Pastor Lyle Arakaki was invited to preach the sermon... "This special worship service was held to mark the beginning of the Week of Prayer for Christian Unity... The Manoa Interchurch Service and Outreach (MISO) organization sponsored this ecumenical service... "MISO includes the St. Pius X Roman Catholic Church, Lutheran Church of Honolulu, Manoa Valley Church (United Church of Christ), as well as the Japanese Adventist Church." -Recorder, March 17, 1986, p 16. "The Glendale [SDA] church is hosting a teaching festival for the Verdugo Council of Churches..." -Recorder, November 7, 1988, p 22. "We [the SDA church] are one with our fellow Christian denominational groups in the great fundamentals of the faith once delivered to the saints." -Questions on Doctrine, p 32.